The Allen's Swamp Monkey is an African primate species that is found in the Congo Basin. Allen’s swamp monkeys are mainly arboreal, spending most their time in the trees. Allen’s Swamp Monkey belongs to the genus of Allenopithecus of the primate order, and belongs to the family of old world monkeys. They are characterized by a strong body physique and grey-green body fur. Allen’s swamp monkey inhabits swamps, riverines, and more open forests including croplands. This species of monkey is most common in lowland forest of Congo basin in the Central African Republic of Congo. Allen’s Swamp monkey species are also found in Cameroon and western region of the Democratic Republic of Congo. Allen’s Swamp monkey conservation status is “Near Threatened,” and the main threat to its survival is hunting. 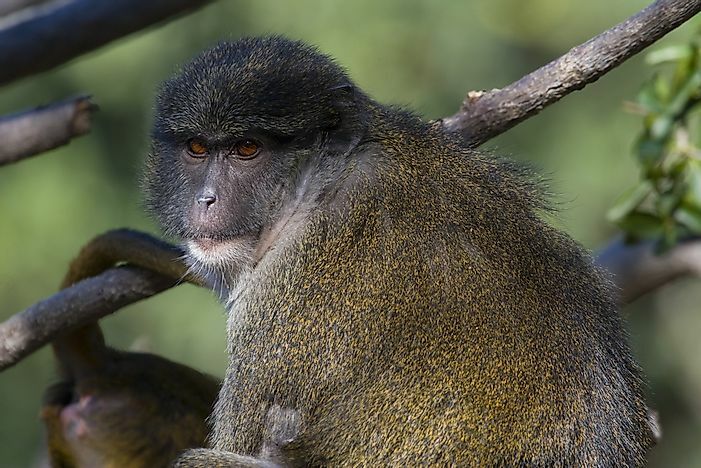 Allen’s Swamp monkey has a strongly built stature with grey, green, and brown fur. The monkey has a reddish face with long hair bundles on the cheek. The fur around the shoulders and the neck are longer compared to the fur in other parts of their bodies. The Allen’s Swamp monkey has slightly webbed fingers and toes, an indication of its aquatic way of life, and the tail is usually longer compared to its body. The body length of a mature Allen’s swamp monkey ranges from 18-20 inches. The tail reaches more than 19 inches long and is usually longer than their bodies. Males are comparatively larger compared to females, with a body weight of 13 pounds while the females weigh slightly above 7 pounds. The lifespan of Allen’s swamp is estimated to be about 28 years. These monkeys are diurnal and social creatures. They always live in a group of 40 or more individuals. Like many other primate species, Allen’s swamp monkeys practice social grooming to strengthen the bonds between troop members. Sometimes smaller groups may break off to forage around. Allen’s swamp monkeys are mainly arboreal, spending most their time jumping from tree to tree but can be found on the ground looking for food. Allen’s Swamp monkeys communicate with other members of the troop through calls and gestures. The calls include deep croaks, grunts, and warning chirps. The Allen’s monkeys feed on fruits, seeds, leaves, fish, and small invertebrates. They usually spend most of their time foraging in the shallow waters and on open grounds. The main predators of Allen’s swamp monkeys are snakes, raptors, and Bonobo but their swampy habitats cushion them from the dangers of the forest. Allen’s swamp monkeys are polygynous, with several females and males. The information about the mating habits of Allen’s Swamp monkey is very scanty. Females give birth to one offspring after a gestation of 5-6 months and may give birth to twins. After three months the young ones are weaned and mature after 3-5 years. Allen’s Swamp monkeys give birth anytime in the year, but most births take place in June. The females are known to be the primary caregivers. The IUCN lists Allen’s swamp monkey a near threatened species. CITES also lists the monkey under Appendix II, which are groups of animals not necessarily facing extinction, but which needs control in trading to ensure their survival. Hunting and habitat destruction are the threats facing Allen’s swamp monkey. The monkey is hunted for its meat which is used for subsistence and commercial purposes. The Venomous Mambas Of Africa: How Many Species Are There?